WASHINGTON — House Republicans have shown no inclination to challenge President-elect Donald Trump on ethics matters. Instead, they are going after federal ethics official who questioned Trump’s potential conflicts of interest. Democrats slammed the move, saying GOP lawmakers are trying to intimidate an independent watchdog for having the temerity to challenge Trump’s business arrangements. Rep. Jason Chaffetz, R-Utah, chairman of the House Oversight Committee, has summoned Walter Shaub Jr., the director of the Office of Government Ethics, to answer questions about his public comments on Trump. “Stepping back from running his business is meaningless from a conflict of interest perspective,” Shaub said of Trump. This week, Shaub issued a scathing review of Trump’s plan to turn over control of his business to his sons. Shaub said in a speech Wednesday that the only way Trump could avoid a conflict of interest as president would be to divest from his business and have his assets placed in a blind trust. “Stepping back from running his business is meaningless from a conflict of interest perspective,” Shaub said of Trump. “Your agency’s mission is to provide clear ethics guidance, not engage in public relations,” Chaffetz wrote. In an interview, Chaffetz said Shaub is offering opinions on conflicts of interest without fully researching the circumstances. 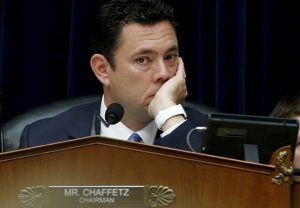 “What he’s doing is highly unethical,” Chaffetz said. Chaffetz said his own letter was drafted before Shaub’s speech. Chaffetz said he has been trying to meet with Shaub since the fall but that Shaub has declined his invitations. “All I wanted to do is try to get him to come in and talk to us,” Chaffetz said. Chaffetz’ letter cited a series of tweets by Shaub in November. In the tweets, Shaub congratulated Trump for agreeing to divest from his business — an agreement that Trump never made. The congressman’s letter did not mention Shaub’s speech. In the speech, Shaub noted that members of Trump’s Cabinet — some of them very wealthy, like Trump — are required to place their assets in a blind trust. Shaub said the president should be held to the same standard. “The plan the president-elect has announced doesn’t meet the standards that the best of his nominees are meeting and that every president in the past four decades has met,” Shaub said. Shaub’s criticism of Trump has been echoed by several government watchdog groups and both Republican and Democratic government ethics experts. They include Norman Eisen, a former chief ethics counselor for President Barack Obama, and Richard Painter, who served in the same role for President George W. Bush. Congressional Democrats sharply criticized Chaffetz for summoning Shaub. “The Oversight Committee has not held one hearing, conducted one interview, or obtained one document about President-elect Donald Trump’s massive global entanglements, yet it is now apparently rushing to launch an investigation of the key government official for warning against the risks caused by President-elect Donald Trump’s current plans,” said Rep. Elijah Cummings of Maryland, then top Democrat on the committee. Some Democrats see a coordinated effort by Republicans to undermine the office responsible for ethics reviews of Cabinet nominees and ensuring they will avoid conflicts of interests. “Instead of honoring his committee’s responsibility to hold the administration accountable, Chairman Chaffetz has appointed himself President-elect Trump’s chief strongman and enforcer,” said House Minority Leader Nancy Pelosi, D-Calif.
A week ago, Shaub complained that Senate Republicans were moving ahead with confirmation hearings before Trump’s choices had reached ethics agreements.